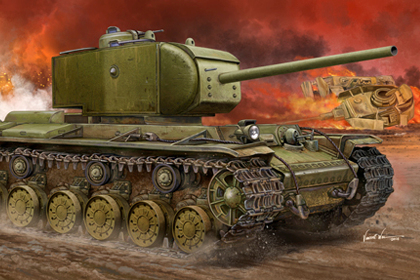 This is the Trumpeter 05553 kit in 1/35 scale, of the ‘KV-220 Super Heavy Tank’. KV-220 (Object 220) Experimental tank based on KV-1. Longer chassis (7 rollers per side). Armor – 100mm. New 850 hp V-2SN engine with turbocharging. New diamond-shaped turret. 85mm F-30 cannon. One prototype was constructed in 1941. The tank was lost in battle. The KV-220-2 had its turret removed (The turret and KV-220-2 were both used in the defense of Leningrad) it was fitted with a KV-1 turret and F-32 cannon. The tank was lost in battle, supposedly later repaired, and sent to a training unit. This entry was posted in Kits, Stash and tagged 05553, 1/35, kv-220, object 220, russian, super heavy tank, trumpeter by Thomas. Bookmark the permalink.